The number of newly-born enterprises in the European Union (EU) as a proportion of the total number of active EU enterprises stood at 9.8% in 2016, slightly higher than the corresponding figure in 2015 (9.6%), informed Eurostat. The birth rates were above 16% in Lithuania (18.8%), Malta (16.4%) and Latvia (16.2%) and were close to the EU average in Spain, France and the Netherlands. 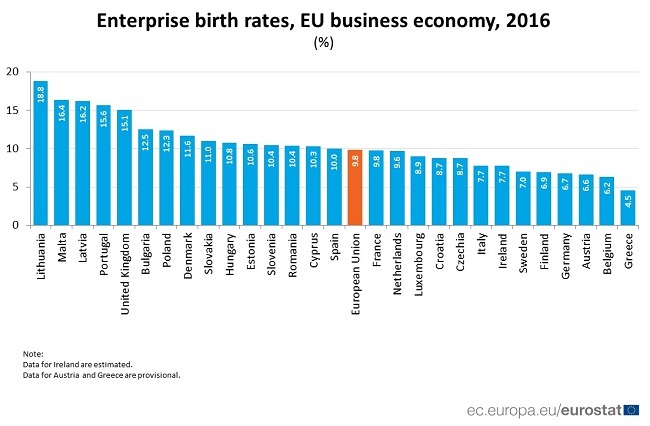 At the other end of the scale, the lowest enterprise birth rates were in Greece (4.5%) and Belgium (6.2%).